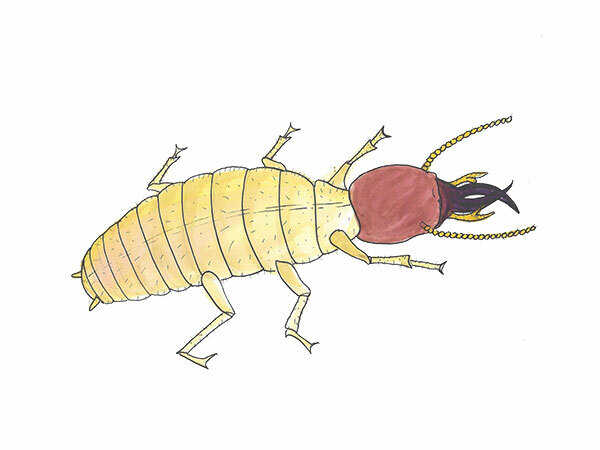 The reproductive formosan termite is yellowish-brown and 12-15 mm long. They have numerous small hairs located along their wings. The worker formosan termite is white to off white in color and their body ranges between 2-3 mm in length. Their head is round shaped and the rest of their body is oval with little definition. Soldiers have an orange-brown oval shaped head with curved black mandibles or pinchers. They have a whitish body and two antennae, which stick out to the side. The formosan termite is a non-native species originally imported from China and first reported in Florida in the 1980s. Today the formosan termite is found throughout Florida, across the southeastern United States and also in Hawaii. Formosan termites are a variety of subterranean termites, which also live in the ground in highly organized colonies. Formosan termites infest inside residential homes, trees and any type of wood both living and dead. They primarily live in the soil, but can also build satellite nests above ground and inside areas where moisture builds up. Formosan termites receive their nutrition from cellulose, which is found in both living and dead plant organisms. Formosan termites commonly infest around trees, rotten stumps, crops, woodpiles and residential homes. They constantly hunt for new food sources and never stop searching. Once a food source is located, the workers notify other termites by secreting a pheromone chemical, and then proceed to search for more food sources. Formosan termites are also known as the Super Termite because of the colossal size of their colonies and their devastating habits. A Formosan termite colony can contain millions of termites, which can produce over 1,000 eggs per day and over 70,000 reproductive termites each year. Within 2-4 weeks, the young termites hatch out of the eggs and are cared for by the other termites until they mature. Formosan termites cannot eat pressure treated wood, however they can eat around it to access other areas of untreated wood. Pressure treated wood is required by code in areas where wood touches soil. The combination of wood, water and soil create optimal conditions for formosan termites. Fix leaky pluming, allow AC units and gutters to drain away from the house and reduce any moisture buildup around the home. Trenching and treating the soil with chemical can create effective barriers for formosan termites. Applying termiticide onto a slab before the concrete is poured is imperative for preconstruction treatments. Monitoring bait systems have become increasingly popular for preventing and eradicating formosan termites. Accessing an entire formosan termite colony can be difficult with chemical treatments because the colonies are so incredibly large. With baiting systems, workers carry lethal doses of laced bait to the nest, providing total colony elimination. Reproductive termites swarm in Florida each year around late Spring/early Summer, following a warm rainy day. Swarms happen at night and especially during times of high humidity. They are attracted to light; therefore bodies and wings will develop around windowsills. Formosan termites invade structures from the ground, connecting shelter tubes from the colony to their food source. Shelter tubes are made out of sand and saliva and are constructed to protect the termites from harsh elements and predators. Damaged wood may not be visible to the naked eye. Formosan termites sometimes spare a thin layer of surface to the wood. Tapping wood with a screwdriver can help with revealing formosan termite damage. Damaged wood will contain an earthy substance and appear gnawed or chewed. Formosan termites sometimes create satellite nests above ground made out of saliva, soil, feces and chewed wood. Above ground nests are created in areas with high moisture content and can only be discovered when tearing apart walls. Annually, formosan termites cause over $1 billion in damage in the United States. Compared to subterranean termites, formosan termites cause more damage in a shorter period of time. They do not consume more wood than other termite species, however their colonies are much larger and incredibly devastating. Colonies can produce millions of workers, which consume wood 24 hours a day, 7 days a week. Formosan termites can also cause power failures due to their ability to chew through electrical cables. Dont hold off! Termites can do incredible damage to a home; if you think you may have termites, call us today for a free termite consultation. Click here for a list of termite FAQs. Cloud Termite and Pest Control services Sarasota termite control, Siesta Key termite control, Longboat Key termite control, Gulf Gate termite control, Lido Key termite control and surrounding areas.